My son went through a very frustrating season with his car not starting. There aren’t many things as deflating as sticking the key in the ignition, and nothing happens. In his case, the problem was intermittent. It would start, and then a day, week, month, or several months later it wouldn’t. On a trip from Florida to Virginia, he stopped at a rest stop, and guess what? The starter demons showed up at the most inopportune time. So, he had the car towed to the closest repair shop. When they got to the repair shop, guess what? The car starts. So, my son calls a family friend who’s an experienced mechanic. Come to find out, that generation of Buicks are notorious for having problems with the anti-theft system in the ignition switch, which causes the car not to start. My son then decides that instead of taking his car to just any repair shop, he’ll take it to the Buick dealership. When he drops the car off, he takes the time to let them know that he thinks it’s the ignition switch. The mechanic works on Buick’s all day, every day. Supposedly, he’s a professional. This problem shouldn’t phase him. He ought to know all the ins and outs; it’s a common problem he should know and understand. The whole reason for choosing the dealership is knowing they’re going to do it right the first time. But the mechanic ignored the input from my son. Now the mechanic does a little more digging and figures out that the anti-theft system is causing the problem and, with some effort, pinpoints the ignition switch as the problem. Now comes the best part! The mechanic says, “No the ECM was bad too.” After pointing them in the right direction twice, they’re asking my son to pay for their $600 mistake. 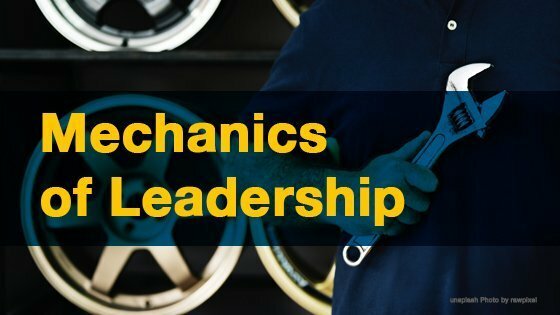 Listening to the drama, all I could think about was the connection between car mechanics and leadership. It’s interesting how poor mechanics and bad leaders have something in common. In their wake is a trail of frustration and expensive experiences. Leaders are learners. They dig in and do the hard work of learning what it means to be a great leader. Leaders listen. They are secure enough to accept input from others and value their ideas. Leaders have character. They are secure enough to know that character is more important than ego and being right. Leaders are transparent. Transparency has a way of building trust. Leaders admit their mistakes and take ownership of them. Funny thing about followers, they extend trust when leaders are transparent. Because bad leadership can be so much more frustrating than poor mechanics, it is vitally important we understand the mechanics of leadership. And if you were wondering, my son did have to jump thru a few hoops, but he did not have to pay for the unnecessary $600 portion of the repair.